As the Wolverine "post-credits scenes" in Marvel Comics run their course, the publisher announced today a new batch of teaser-style shorts to run at the end of stories. The new scenes will build up to the upcoming "Extermination" event, which will run through the X-Men titles and leave a new status quo for that part of Marvel's publishing line. 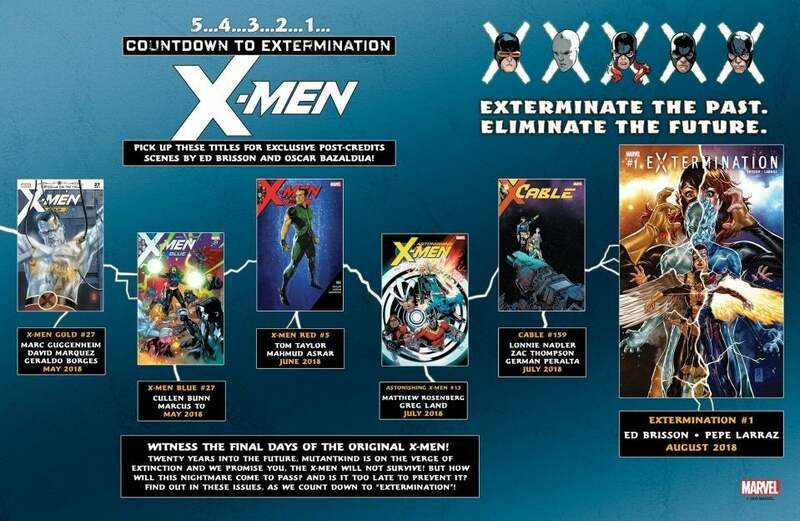 It is widely believed that Extermination will finally see the final fate of the "First Class" X-Men, who have traveled to the future from the past and stayed much longer than anybody ever anticipated. The original five X-Men were first brought to the future by Beast following the events of Avengers vs. X-Men, in which the X-Men went to war with Earth’s Mightiest Heroes and Cyclops, after being corrupted by Dark Phoenix, killed Professor X. Beast hoped that seeing the original X-Men would help Cyclops return to his old self. It didn’t work. Beast proved unable to send the original X-Men home, and they decided to stay in the hopes that they could build a better future than the one they had found. For a time, it seemed like the Marvel timeline had self-corrected. Beast, the young one that was brought forward in time, eventually figured out how to go back in time again, but when he got there he was surprised to see that the original X-Men were still operating as normal. As revealed in X-Men Blue, this was actually a ruse put on by the Brotherhood of Evil Mutants from another timeline who hope to reshape the future by replacing the original five X-Men. The time-displaced X-Men defeated the Brotherhood but came to realize that in order to maintain the timeline’s integrity they must at some point return to the exact moment in history they were taken from and that they would have to do so without any memory of the future they visited.